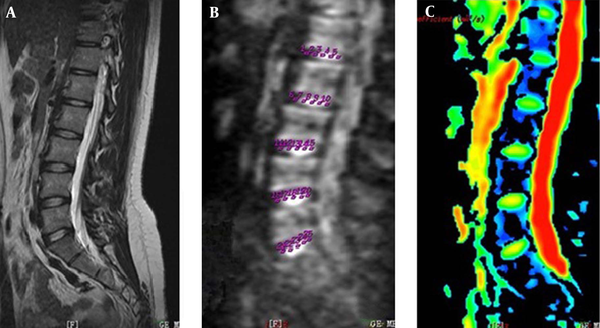 To Cite: Shen S, Wang H, Zhang J, Wang F, Liu S. Diffusion Weighted Imaging, Diffusion Tensor Imaging, and T2* Mapping of Lumbar Intervertebral Disc in Young Healthy Adults, Iran J Radiol. 2016 ; 13(1):e30069. doi: 10.5812/iranjradiol.30069. Background: Although conventional magnetic resonance imaging (MRI) could provide excellent detection of morphological changes in the diagnosis of lumbar disc degeneration (LDD), it has some difficulties in discriminating minimal changes associated with early LDD before morphological or clinical alterations. Therefore, newer MRI techniques have emerged for investigation of early LDD. Objectives: The aim of this study was to use diffusion weighted imaging (DWI), diffusion Tensor Imaging (DTI) and T2* mapping to detect lumbar discs in healthy young adults, to evaluate if they could depict the microstructural changes of early LDD. Patients and Methods: Apparent diffusion coefficient (ADC), fractional anisotropy (FA), and T2* images of the lumbar discs were obtained for 40 asymptomatic young subjects (19 males and 21 females; mean age of 24.3 years), using DWI, DTI and T2* mapping with a 1.5-T MRI scanner. ADC, FA, and T2* values were measured to compare five regions of interest (ROI) selected in each nucleus pulposus (NP) of the images. Results: The ADC, FA, and T2* values were different (P < 0.05) among different ROIs within the same disc or among corresponding ROIs in different level discs. While the average values of ADC increased regularly with the lowering of the anatomical location (P < 0.05), the average FA and T2* values also associated with the anatomic locations, showed an increase in L4-L5 and L5-S1 discs (P < 0.05). Conclusion: ADC, FA, and T2* values may quantitatively reflect the microstructural characteristics of NP, therefore they could be used to detect the minimal changes of early LDD. Low back pain (LBP) such as lumbar disc herniation (LDH) is extremely common amongst the human population, with a reported incidence rate of 70% during a person’s lifetime (1). Recent studies have indicated that LBP, which brings great distress to patients, is closely related to the occurrence and development of lumbar disc degeneration (LDD), and LDD is the pathological basis of LBP, thus, the early diagnosis and control of LDD is the most important step for the treatment of LBP (1, 2). In human beings, LDD begins at approximately 16 - 20 years old, and its initiation and development is caused by physiological degeneration, mechanical factors (1) and high-load stress, while other factors can accelerate the degeneration process (3). The early stage of LDD starts from nucleus pulposus (NP) metabolism imbalance, which mainly involves a gradual loss of proteoglycan (PG), collagen damage and increased water content, and these biochemical changes are not accompanied by significant structural disturbances in the tissue (4, 5), thus, these are believed to be the indicators of early LDD before morphologic changes and could be reflected by newer imaging techniques, such as diffusion weighted imaging (DWI), diffusion tensor imaging (DTI) and T2* mapping (6-8). Therefore, DWI, DTI and T2* mapping could be potential tools for the study of early LDD. 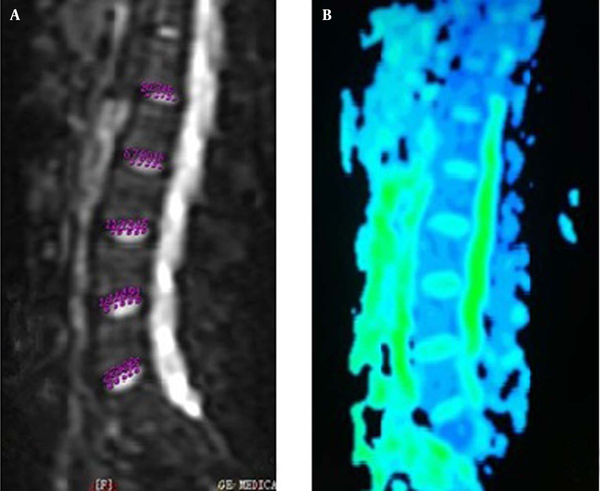 This study aimed to use DWI, DTI and T2* mapping to investigate lumbar intervertebral discs in healthy young adults, and to evaluate if they could reflect microstructural changes of early LDD. Forty four young healthy volunteers were randomly selected from college students. Inclusion criteria were being asymptomatic, younger than 30 years and within the normal range (18.5-23.9) of body mass index (BMI). Exclusion criteria included being an athlete or smoker, and having low back pain, abnormal imaging, lumbar deformities, spinal trauma and spinal surgeries. Four participants were removed (LDH or lumbarization). The final roster included forty subjects (19 males and 21 females; mean age of 24.35 ± 1.8 years) with no difference in cohort age, BMI, height, or weight, and it was hypothesized that early LDD had already occurred in the participants. All participants provided written consents and this study was approved by the human research ethics committee of Jinan University, Guangzhou, China. The subjects were scanned with the application of spine coil in the supine position, using a clinical 1.5T MRI scanner (GE Signa HD; the first affiliated hospital of Jinan University, Guangzhou, China). All the scans were performed in the afternoon, because there are changes in T2 relaxation values each morning, afternoon, and evening (9). 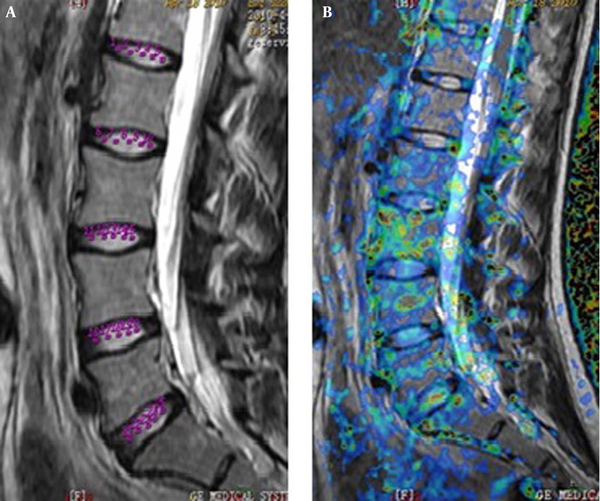 T2 weighted imaging (T2WI) of the lumbar discs was performed previously, for use as a screening tool for abnormal images (10). Diffusion weighted imaging was acquired using a spin echo echo-planar imaging (SE-EPI) on the sagittal view, with the scanning parameters as follows: repetition time/time echo (TR/TE) = 2300 ms/64.9 ms, slice thickness/spacing (thn/spa) = 4 mm/1 mm, acquisition matrix = 128 × 64, field of view (FOV) = 34 cm, number of excitation (NEX) = 4. Diffusion tensor Imaging sagittal scanning was performed with SE-EPI, under the following parameters: TR/TE = 2500 ms/80.8 ms, thn/spa = 4 mm/1 mm, matrix = 128 × 64, FOV = 34 cm, NEX = 4, b-value = 800, diffusion direction = 13, and scan time of one minute and 15 seconds. T2* mapping was acquired by gradient recall echo (GRE) with the following parameters: TR = 120 ms, TE = 5.3, 15, 24.6, 34.2, 43.8, 53.5, 63.1, 72.7, 82.3, 92, 101.6 and 111.2 ms, thn/spa= 4 mm/1 mm, matrix = 256 × 128, FOV = 34 cm, NEX = 1, and scan time of three minutes and 44 seconds. The acquired T2WI images were examined by two radiologists with more than ten years of experience to reach an agreed diagnosis: abnormal images such as deformities and LDH were excluded from the study. The raw data of DWI, DTI, and T2* mapping were transferred to the sun advantage workstation 4.2 and processed using GE-Functool software, to generate the apparent diffusion coefficient (ADC), fractional anisotropy (FA), and T2* pseudocolor images. On the intermediate layer of the ADC sagittal image, the central regions of NPs were divided to five equal parts, and five ROIs were placed from anterior to posterior on the image, which were designated as the front point, front-middle point, midpoint (center of NP), middle-back point, and back point, to measure, respectively, the ADC values (Figure 1). Furthermore, FA and T2* values were obtained in the same way as described above (Figures 2 - 3). In order to reduce the influence of disc size and partial volume effect on results, the setting of ROIs was determined by two radiologists with professional experience of MRI, and each ROI was drawn following these principles: building on T2WI images, to ensure the appropriateness of each ROI selection in each NP, and avoid selection of the adjacent tissue of NP by mistake; trying to reduce the ROI area to be less than or equal to 2 mm. Figure 1. Diffusion weighted imaging of lumbar discs from the youngest female participant (18 years old). A, Magnetic resonance imaging with T2 weighted imaging showing normal signal on sagittal view; B, Five regions of interest of each disc to measure for apparent diffusion coefficient (ADC) values on ADC image; C, ADC pseudocolor image. Figure 2. Diffusion tensor imaging of lumbar discs from the same participant. A, Five regions of interest of each disc to measure for fractional anisotropy (FA) values on the FA image; B, FA pseudocolor image. Figure 3. T2* mapping of lumbar discs from the same participant. A, Five regions of interest of each disc to measure for T2* values on T2* image; B, T2* pseudocolor image. The measured results were processed using the SPSS statistics software package (ver. 13.0; SPSS Inc. Chicago, Illinois, USA). A normal distribution was obtained using the normality test, and single-factor analysis of variance (one-way ANOVA) was then applied to compare the differences in ADC, FA, and T2* values among different ROIs in the same NP or among corresponding ROIs in different level discs. The obtained data were presented as mean ± standard deviation (SD). P values of < 0.05 were considered statistically significant. A total of 200 lumbar intervertebral discs were detected in this study by DWI, DTI and T2* mapping. Statistical analysis indicated that there were differences in ADC, FA and T2* values among different ROIs within the same disc (P < 0.05, Tables 1 - 3). While the mean values of ADC and T2* were highest at the center (midpoint ROIs) of 200 NPs and declined gradually toward the periphery (P < 0.05, Figure 4), the FA value was lowest at the center of NPs yet increased towards the periphery (P < 0.05, Figure 4). The ADC, FA and T2* values at corresponding ROIs at different levels were also different (P < 0.05, Tables 1 - 3). The mean ADC values of the same level discs increased regularly with the lowering of the anatomical location from L1-L2 to L5-S1 (P < 0.05, Figure 5). The mean values of FA and T2* also correlated with the anatomic locations; while they both increased significantly in L4-L5 and L5-S1 discs (P < 0.05, Figure 5). There were significant differences in ADC values among different ROIs in the same disc (P < 0.05). The ADC values at corresponding ROIs were different in different planes: at the front point, F = 14.627, P < 0.001; at the front-middle point, F = 4.781, P = 0.001; at the midpoint, F = 11.465, P < 0.001; at the middle-back point, F = 8.416, P < 0.001; yet at the back point with no difference, F = 0.932, P = 0.446. There were significant differences in FA values among different ROIs in the same disc (P < 0.05). Fractional anisotropy values at corresponding ROIs in different planes were different: at the front point, F = 9.255, P < 0.001; at the front-middle point, F = 5.846, P < 0.001; at the midpoint with no difference, F = 1.772, P = 0.136; at the middle-back point, F = 4.014, P = 0.004; at the back point, F = 3.668, P = 0.007. There were differences in T2*values among different ROIs in the same disc. T2* values at corresponding ROIs in different planes were different: at the front point, F = 7.803, P < 0.001; at the front-middle point, F = 8.175, P < 0.001; at the midpoint with no difference, F = 1.088, P = 0.364; at the middle-back point, F = 16.320, P < 0.001; at the back point, F = 15.820, P < 0.001. Figure 4. The mean apparent diffusion coefficient, fractional anisotropy and T2* values of different regions of interest in 200 nucleus pulposus. A, The highest ADC value appeared at the midpoint of NP and declined gradually toward the periphery (F = 2.854, P = 0.041); B, The FA value appeared lowest at the center of NP yet increased towards the periphery (F = 98.830, P < 0.001); C, The T2* value appeared highest at the middle of NP and reduced toward the periphery (F = 3.34, P = 0.01). Figure 5. The mean values of apparent diffusion coefficient (ADC), fractional anisotropy (FA) and T2* from L1-L2 to L5-S1. 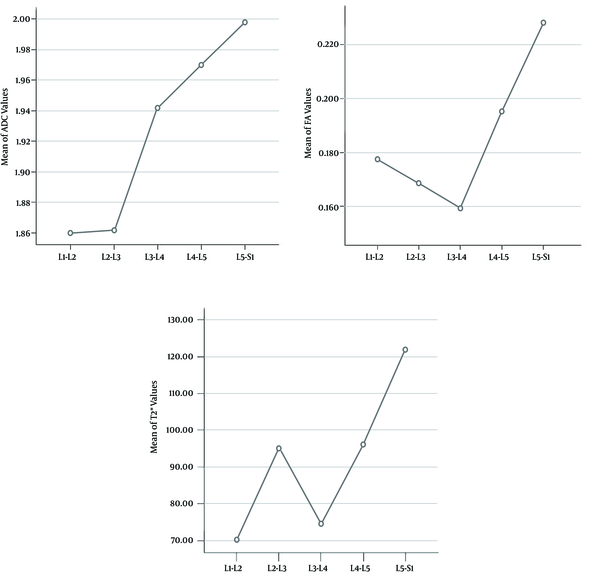 A, The ADC value increased regularly with the lowering of the anatomical location (F = 1.014, P = 0.042); B, The FA value increased significantly in L4-L5 and L5-S1, and the most obvious increases appeared in L5-S1 (F = 12.884, P < 0.001); C, T2* value appeared highest in L5-S1 (F = 2.89, P = 0.02). Although conventional MRI is very useful in the diagnosis of LDD, such as Pfirrmann scale with T2WI (10), it is useless for assessing early LDD, while ultra-structural alterations are difficult to be identified in T2WI (11). Therefore, this study aimed to investigate the potential of DWI, DTI and T2* mapping for the detection of microstructural characteristics of early LDD. It has been universally acknowledged that LDD begins at approximately 16 - 20 years old in human beings, and its initiation is caused by physiological degeneration (1). Based on this background, we designed this original research as a prospective cohort study for assessment of the hypothesis of early LDD, and investigated whether DWI, DTI and T2* mapping could be used to detect minimal changes of early LDD within young healthy adults. The subjects of this study were selected from young asymptomatic college students, and all the subjects were younger than 30 years, which meant they were at the starting stage of intervertebral disc physiology degeneration. Therefore, it was hypothesized that early LDD had already occured in the participants. Finally, we found that DWI, DTI and T2* mapping could act as sensitive and noninvasive methods for quantitative characterization of the biochemical status of NP, while the increase of the mean values of ADC, FA, and T2* of NP could act as imaging markers of early LDD. Furthermore, DWI and DTI reflect the microstructural changes of tissue through describing the diffusion of water molecules. The diffusion of water molecules is divided to isotropic and anisotropic types. Isotropic diffusion is proportional to the mean ADC values in each direction; and FA values reflect the proportion of anisotropic diffusion within the total diffusion tensor. Diffusion weighted imaging is used to detect the capacity of water diffusion and generates ADC images for contrast; DTI describes the directional characteristics of water diffusion and produces FA images. In the present study, the differences in the mean ADC and FA values of different ROIs in 200 NPs closely coincided with the biochemical characteristics of NP (12), i.e. higher contents of PG and water appeared in the NP center (high ADC values and low FA values in the middle, see Figure 4), and water content gradually declined and collagen fibers increased in the periphery (low ADC values and high FA values in the periphery, see Figure 4), suggesting that ADC and FA values can be used to effectively monitor the activity of water molecules in NP. T2* mapping of intervetebral discs is a relatively new technique. T2 mapping of NP correlates well with microstructural variations in PG, water content and collagen (7, 13); T2* mapping is based on T2 mapping with a clearer imaging contrast and a higher signal-to-noise ratio (SNR) (14, 15). In this study, T2* mapping was applied to detect biochemical changes of NP. Our results showed that T2* values changed among different ROIs (Table 3) which were consistent with DWI and DTI image information, i.e. higher water content in the center, and lower water content yet higher content of collagen fibers in the periphery. Obviously, DWI, DTI, and T2* mapping can validate each other for reflecting the characteristics of biochemical composition. Some researchers have already used DWI to study LDD. Kealey et al. (16) contrasted normal and degenerated discs using DWI and showed that the ADC values of degenerated discs were reduced by 9% as compared with those of normal discs. The study of Wu et al. (17) also showed that the ADC values of degenerated discs were significantly reduced, and the ADC values of lower lumbar discs were less than those of the upper discs. However, our study results revealed that differences existed among the ADC values of corresponding ROI at different levels (Table 1), mostly manifesting as a gradual increase of ADC values with the lowering of anatomical location, and that the mean ADC values of lower discs were significantly elevated when compared with those of upper discs (Figure 5). Our analysis suggested that increased ADC values might indicate early LDD, which was in contradiction with the results of Kealey (16) and Wu (17). Such inconsistency may be due to differences amongst the study subjects. The subjects of Kealey et al. (16) were elder patients with severe LDD, while the subjects of our study were young healthy adults, which may have had early LDD. The initiating factors of early LDD are the regression of PG and the destruction of collagen cross-linking in NP (10, 18). Especially with PG degradation, the bound water molecules will be released, and lead to an increase of free water volume, which hence enhances the capacity of water diffusion, giving rise to an increase in ADC and T2* values. With the development of LDD, the water content of NP decreased gradually, and thus the ADC value was accompanied by this decrease (16, 17). Therefore, our results seemed to be in contradiction with previous studies. Our results showed that the increases of ADC values at corresponding ROIs in different planes might indicate the occurrence of early degeneration, and it is the same reason that T2* values also increased in the lower lumbar discs (Tables 1 - 3). Based on the mutual corroboration between DWI and T2* mapping, we suggest that the above results could be explained by the biochemical changes during early LDD. In addition, a study on early degeneration of articular cartilage showed that the reduction of PG might cause an increase in T2 values and elevated T2 values may reflect the decrease in PG concentration; these results were supported by histological evidence (19). The increased T2* values in our study might thus indicate PG content loss in NP and the occurrence of early degeneration. With regards to FA values, degenerative matrix alterations and the disruption of the collagen network in NP led to an increase in anisotropic water diffusion during early LDD (18), and thus elevated FA values could be obtained by using DTI. 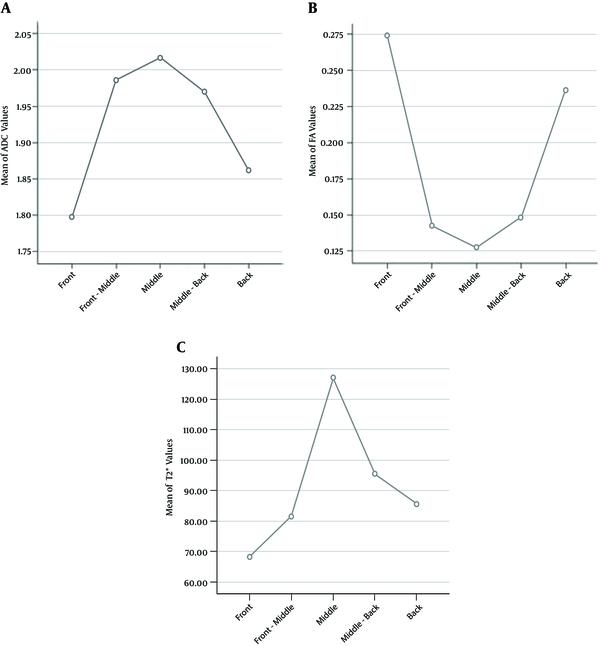 In this study, differences existed among the FA values at corresponding ROIs in different planes (Table 2), and the increases of mean FA values from L1-L2 to L5-S1 were considered to reflect LDD (Figure 5). The results of Zhang et al. (11) also indicated that increased FA values were correlated with LDD, and these results were consistent with that of our study. Therefore, FA values may quantitatively assess disc degeneration, and an increase in FA values may be a sign of LDD. Moreover, the comprehensive analysis of the present study indicated that the mean ADC, FA and T2* values of lower discs (L4-L5 and L5-S1) were accompanied by a synchronized increase (Figure 5), and all three indices indicated early LDD, thus suggesting that the study results were objective and accurate. Regarding the biomechanics point of view, lower lumbar discs suffer from a higher probability of degeneration under the influence of higher mechanical stress, thus, L4-L5 and L5-S1 were more susceptible to degeneration (20). Therefore, the mean ADC, FA and T2* values of L4-L5 and L5-S1 were higher than upper discs, and the study of Kealey et al. (16) also stated that the degree of lower discs degeneration was more significant than cephalic discs. It is important to mention that the limitation of our study was the lack of histological evidence and control group for comparing the results. In our study, it was hypothesized that all the subjects were at the initial stage of intervertebral disc physiology degeneration while the microstructural changes were not detected in conventional MRI (1, 11), however, we could evaluate the biochemical changes of early LDD by using DWI, DTI, and T2* mapping, moreover, lower discs L4-L5 and L5-S1 were more prone to degeneration, therefore, we believe that early LDD should probably occur at L4-L5 and L5-S1 discs. Therefore, L4-L5 and L5-S1 discs may be used as parameters of degeneration for assessment. Despite all the rhetoric results, such speculations surely warrant further investigations. Furthermore, there were still other factors of influence, such as activity, mechanical stress, disc size, etc. Thus, there should be a separate measurement for LDD. In conclusion, although the study results need further histological verifications, they still clearly demonstrated that DWI, DTI and T2* mapping could prospectively act as sensitive tools to detect microstructural changes of early LDD, respectively, and that a combination of the above three indices can enhance the accuracy of imaging diagnosis. The authors thank all the participants and their families for their participation in our study. Authors’ Contribution: Si Shen and Hao Wang contributed equally to this work, as the same first author. Study concept and design: Si Shen, Hao Wang and Si-run Liu; acquisition of data: Si Shen and Jing Zhang; analysis and interpretation of data: Si Shen, Jing Zhang and Fei Wang; drafting of the manuscript: Hao Wang; critical revision of the manuscript for important intellectual content: Si Shen, Hao Wang and Si-run Liu; statistical analysis: Si Shen and Hao Wang. Financial Disclosure: The authors declare that they had no conflicts of interest. Funding/Support: This study was supported in part by grant A2013351 from the national health and family planning commission of Guangdong province and by a scientific research fund (grant No: 2014108) from the first clinical medical college of JiNan University.